"What if what they really want is to have us herd our children into the stadiums like we're doing, put soldiers on the street, have Americans looking over their shoulders. Bend the law, shred the constitution just a little bit. Because if we do this, then everything that we have bled and died and fought for is over and they've won. They've already won!" Mention the name Edward Zwick to most and you will be met with a blank stare. Mention the movies that he has directed and the thoughts and opinions of the films from those told will quickly follow. Perhaps more than any other director working today, Zwick still remains a virtual unknown. But with films like Glory and Courage Under Fire, and even the sweeping vistas of Legends Of The Fall to his credit, Zwick has a talent that is hard to miss. But with The Siege, a thriller about terrorism hitting the United States, Zwick takes a large step backward. After the abduction by the US military of a Muslim leader believed to be responsible for the bombing of an army barracks overseas, New York City quickly becomes the target of numerous terrorist attacks. From a bus, to a Broadway theater, and even the FBI headquarters in New York, nothing is safe. As the attacks start getting closer and closer the President decides that declaring martial law is the only way to save the city. General William Devereaux (Willis) argues against the institution of martial law, but is nonetheless ready to order the 10,000 troops at his command to hit the streets. Anthony Hubbard (Washington), the chief FBI agent in charge of investigating terrorist activities is also opposed to martial law. Hubbard isn't helped when he develops a shaky alliance with CIA agent Elise Kraft (Bening), who seems to know more than she says. With the growing threats of martial law—as well as the next terrorist bombing—inching closer Hubbard must try to resolve both before time runs out. There is a strong message sent out at the center of The Siege: when does our need for safety supercede our right to freedom? It is an intriguing question to be sure, but Zwick doesn't quite handle it correctly. In the scenes where this question is at the forefront, the film is riveting. But in other scenes where the story becomes more like cat and mouse games between the Army, FBI, and CIA, all interest is lost. The Palestinian community in New York is treated much like the Japanese population in America was during the early to mid 1940s, yet that is all we know about the problem. A smarter and more tension-filled film would have shown both sides, not just Hubbard's attempts to make things right. Zwick, who also shares script credit, does do a fine job behind the camera. Many of the more action-oriented scenes create a nice amount of tension, and even though the film's final thirty minutes falls into clichés, the scenes are very well done. The cinematography by (Scorsese and Cone Brother collaborator) Roger Deakins is worthy of praise as the film has a nice, almost gritty look to it. 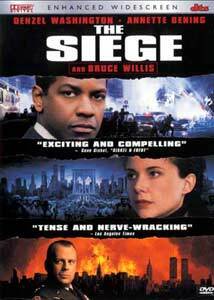 Like most Edward Zwick films, the cast assembled for The Siege is of the highest caliber. Denzel Washington, a Zwick regular, is terrific as Hubbard. His scene towards the end of the film with both Bening and Willis during an interrogation is terrific, as are his moments with his FBI task force. Bening is the weakest link in the cast, as she doesn't have much to work with. And Willis has little more than a cameo as Devereaux, and comes off a bit over the top as only Willis can be. The real standout is Tony Shalhoub as Washington's partner; he has just the right amount of dramatic skill and comic timing to play the part perfectly. Image Transfer Review: Originally released by Fox in April of 1999 in a nonanamorphic version, this re-issue of The Siege boasts a beautiful new anamorphic transfer. Framed accurately at 2.35:1, Roger Deakins cinematography for this film has never looked better. Detail and sharpness are the biggest improvements, as are black levels and the lack of edge enhancement. Like most of the recent re-issues from Fox, this is a vast improvement over the previous release. Audio Transfer Review: Fox has graced this new release with a wide variety of soundtracks, the biggest addition being a stellar DTS surround mix. The Dolby Digital 5.1 track is the same from the previous release that was already quite good, with clear dialogue and a nice separation between the left and right speakers and an aggressive use of the split surrounds. The .1 LFE channel is often clean and tight especially in the scenes with explosions. The musical score is nicely spread across the speakers as well. That being said, the DTS track is a few decibels louder, but aside from that there are never really any glaring differences between the mixes. But rest assured that whichever track you choose, this is a very well done mix from Fox. A Dolby 2.0 channel mix is also made available in both French and English. Extras Review: Even more baffling than the plot is the lack of extras on this disc. Edward Zwick has been very involved with his other films on DVD, yet his latest gets a poor treatment. The film's theatrical trailer is presented in Dolby 2.0 sound and looks good, but there should be more special features. While I had problems with the script for The Siege, there is no denying that it is an entertaining movie. The performances by both Washington and Shalhoub are terrific, as are both the newly remastered audio and video transfers. The lack of extras is difficult to overlook, but if you like the movie these new improvements over the old disc make this worth picking up.